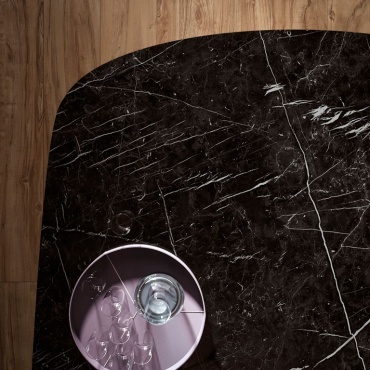 A deep, natural and compact black, traversed by irregular white veining. Nero Marquina by Atlas Plan offers the perfect response to every type of design requirement, creating luxurious and exclusive spaces. Slabs sized 162x324 cm in black marble-effect porcelain stoneware. The slabs are available in silk and lapped finishes with a thickness of 12 mm. The large size makes the slabs the ideal covering for large spaces as well as for meeting room tables, kitchen islands and worktops, hotel lobbies and receptions, bar and restaurant counters. Nero Marquina Habitat: Nero Marquina lappato lux is paired with Etic Pro Noce and Kone Pearl by Atlas Concorde. These materials are coupled with exclusive furnishing elements for a stylish and timeless meeting room.